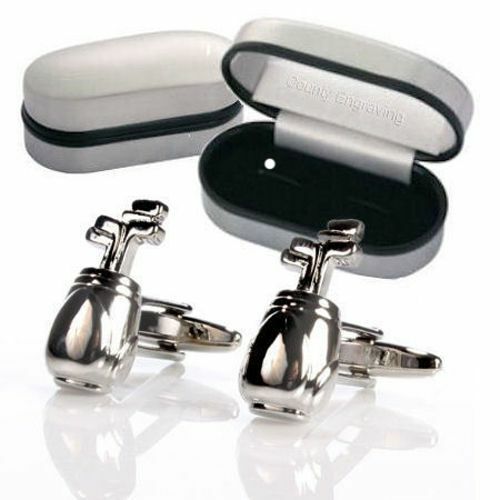 Golf Bag design silver plated cufflinks. Perfect for any Golf Player or Fan of the Game. Golf Bag design silver plated cufflinks, a perfect gift for any golf player or fan of the game, engraved with your personal message. They can also be given as a gift for Birthdays, Retirements, or even to the Best Man or Ushers at your wedding. The golf bag cufflinks are approx 2.5cm tall. For engraving we recommend 4 lines of 15 characters per line, including spaces, which will be placed onto the lid of the chrome case. If no engraving is required, please leave the engraving box blank.